Spacecraft's music addresses the question, what does it 'sound' like to be in space? This is a CD for fans of early-mid 70's Tangerine Dream. Electronic journeys with detailed attention to each sound and its placement in the music. In fact, the music was inspired by recordings of data transmissions from the Voyager spacecraft exploring Jupiter that were downloaded from the NASA internet website. 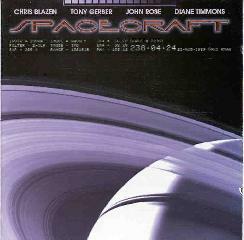 Spacecraft's members are Tony Gerber, John Rose, and Diane Timmons, all on synthesizers, and Chris Blazen on sampler and electric sustaining koto (a homemade instrument). The band has performed a number of times in planetariums and will soon release a recording of a show at the Hummel Planetarium. Over an hour of slowly traveling through the cosmos for fans of electronic spacescapes. You can visit Spacecraft at their web site. You can also hear sound files at the mp3.com web site.